Do you know that excess sebum can aggravate skin sensitivity? A lot of people who have both conditions – skin sensitivity and oily skin tend to place more emphasis on choosing products that help with their skin sensitivity. This is not enough. Excess sebum generated will deteriorate as skin gets more alkaline, turning into irritants to cause flare-ups within the skin layers. Hence it is important to choose products that effectively control skin sensitivity while reducing sebum secretion from the source. Introducing Japan’s No. 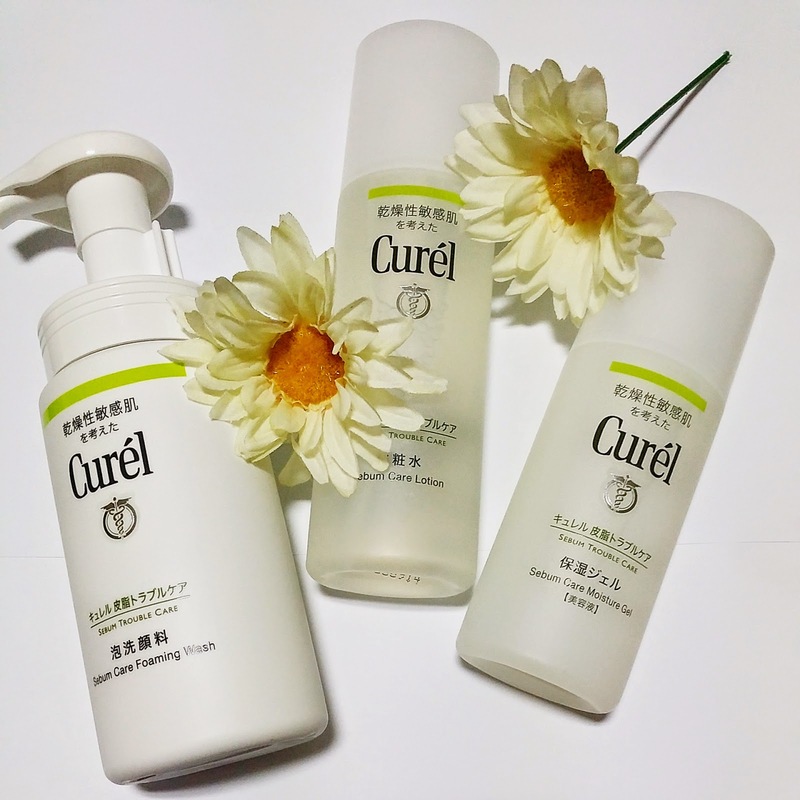 1 brand for sensitive Asian skin, Curél. A new skincare range specially formulated for sensitive and oily or combination skin types. The Curél Sebum Care range – comprising a Foaming Wash, Lotion and Moisture Gel – offers the skincare essentials to properly manage both skin sensitivity and sebum secretion. Ultra fine foam with sebum solvent to thoroughly cleanse dirt and excess sebum while protecting ceramide. 1. Apply two full pumps directly onto wet skin. 3. Gentle massage and rinse off thoroughly. Reviews: Foam type of cleanser is very gentle to our skin, specially recommended to sensitive skin. I always love fragrance-free products which doesn’t sting our face and dry our skin. Non-sticky formula prepares skin for better absorption of moisturiser / essence that is used after the lotion. 1. After cleansing, apply lotion gently over the whole face. 2. Apply twice daily, in the morning and at night. Reviews: Alcohol-free, the non-greasy & sticky lotion, gave a refreshing feel after patting or applied onto the skin. Liquid based gel spreads easily for speedy absorption into deeper layers of skin without leaving skin sticky. Reviews: Perfect for oily & sensitive skin, liquid based gel type of moisturizer doesn’t make your skin feel greasy or sticky. You will be surprised that your skin absorbed the gel in seconds! Tested & Proven on my hand and face. After using Curel Sebum Care for a week, my skin is not oily as before, fine lines reduced and brighten up my skin tone too. Curél Sebum Care range is available at selected Guardian and Watson’s stores from 16 June. For more information, please visit http://web.kao.com/sg/curel/ or https://www.facebook.com/Curel.SG. Want to try out Curel Sebum Care too?